NSBRI’s Mentored Research Program in Space Life Sciences is conducted at both Texas A&M University and Massachusetts Institute of Technology (MIT) through the Harvard-MIT Division of Health Sciences and Technology. Students in these programs work toward a Ph.D. that focuses on space life sciences. The program is developing modules to strengthen current graduate curricula at these two institutions enabling students to experience advanced courses in biomedical science and engineering, specifically as these fields relate to the space program. Each year, young scientists from the NSBRI-sponsored Mentored Research Program participate in a 10-week summer enrichment program in Houston. The program includes a week of space life sciences lectures followed by a nine-week assignment in a NASA Johnson Space Center laboratory. The National Space Biomedical Research Institute (NSBRI) sponsors this Mentored Research Program, which trains graduate students in space life sciences, biomedical engineering, medical sciences, and space medicine for a broad range of possible career opportunities. The program provides students with a combination of science and engineering coursework, clinical experiences, space-related research apprenticeships, and thesis research options at MIT, Harvard, and associated hospitals. The Bioastronautics training program is part of HST’s Medical Engineering and Medical Physics (MEMP) Ph.D. program. The program is led by Laurence Young, Sc.D., a member of NSBRI’s Sensorimotor Adaptation Team and MIT Apollo Program Professor of Astronautics. Applicants to MEMP/Bioastronautics must meet the general requirements for MEMP applicants, which include a baccalaureate degree in engineering or physical science and demonstration of a sustained interest in applications of engineering and physical science to biology or medicine through courses, research, and/or work experience. In addition, candidates for MEMP/Bioastronautics must have completed at least a bachelor’s degree or substantial minor in a related area such as aeronautics and astronautics, mechanical engineering, electrical engineering, biomedical engineering, mathematics, or physics, as well as coursework and/or research experiences demonstrating a sustained interest in space life sciences. Detailed information about the program is available here. Students interested in the Bioastronautics Program apply via the MEMP PhD Program – instructions can be found here. December 15, 2015 is the deadline to apply for Fall 2015 admission. Students who participate in the Ph.D. Training Program in Space Life Sciences earn a Certificate in Space Life Sciences while obtaining a doctoral degree in genetics, kinesiology, nuclear engineering (health physics), nutrition or a M.D./Ph.D. (or Ph.D.) in medical sciences from the Texas A&M University Health Sciences Center Graduate School of Biomedical Sciences. Joanne Lupton, Ph.D., and Nancy Turner, Ph.D., lead the program at Texas A&M. Please visit the Admission Criteria webpage or the program flyer for additional information. The National Space Biomedical Research Institute (NSBRI)-sponsored Mentored Research Program in Space Life Sciences at Texas A&M University (TAMU) is currently accepting applications for Fall 2015. Students participating in this program work toward a Ph.D. in Biomedical Engineering, Genetics, Nutrition, Kinesiology or Nuclear Engineering (Health Physics), or a M.D./Ph.D. (or Ph.D.) in Medical Sciences from the Texas A&M University Health Sciences Center. Students will focus their research on space environment-induced bone loss, muscle wasting, cosmic radiation damage and/or changes in metabolism. The Space Life Sciences graduate program at TAMU is designed with immersive components including: fundamental courses in space life sciences, individual research and an experiential component with work at Johnson Space Center, Brookhaven National Laboratory and/or University of Texas Medical Branch. 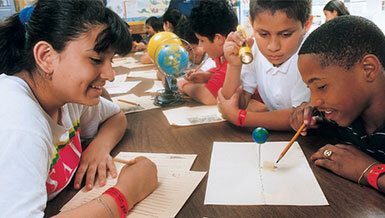 All trainees participate in outreach by teaching elements of space life sciences in a K-12 setting. To learn more about the program, please visit the website. The deadline for submitting an application package is February 12, 2016.